Sunny Martin died May 4th, 2003, shortly after celebrating her 90th birthday at a gala party given by her stepdaughter, Virginia McIntyre, and attended by many. In the invitation was a request for a special memory. I did not attend and did not return the page for the memory and for this my regrets are piled high and heavily on my heart. I did call her and talk with her shortly after the big occasion and she talked excitedly about the nice things that were said and the lovely people who came. She was truly honored. I regretfully responded, "Oh Sunny, you do have so many but don't forget how spread out across the country most of us are” - and of course we were to see each other at the ICHO convention in October, whose site she had recommended and at which she had promised to give us a short greeting and some of her cowboy poetry. For those of you who don't know her, she is one of the founders of the first Curly registry, the ABC, in 1971 to honor and preserve the wonderful curly whose distinct traits she recognized. Sunny could do everything, including editing the Curly Cues, registering the curlies, running the yearly conventions, getting myriads of door prizes, and taking over Ely with banners across main street advertising the curly at convention time. She was extremely intelligent, didn't need a copy editor, and remembered every antic of every curly horse she ever registered as well as their owners. She also could talk on the phone about curlies for hours. She gave every curly owner who called the office a personal greeting and her enthusiasm was catching - it sure caught me. She would drive her 20-year-old truck everywhere when a visitor stopped by, including showing the elk viewing area around Ely, the mines - driving perilously close to the edge of the mountain roads - or taking the long drive out to the Damele ranch with three homebaked pies and a huge pot of beans. Her secret for her pie dough was a teaspoon of vinegar. Same for her clam chowder. Thanks for these memories Sunny and for touching so many of our lives with your strengths and convictions. You were my cowgirl hero and in "Spar" ation. Sharon Williams, a founding ICHO member and a thoughtful friend of Curly horses and horse people for many years, passed away on Feb. 8, 2006 after a valiant battle with melanoma. Sharon owned Frostfire Stables in Indiana. She studied foundation bloodlines, networked with Curly owners and breeders and helped the Curlies go back to the Sioux program, sponsored by Rod Vaughn, by providing transport and breeding to Fostrfire's Big Mac. Sharon was the original editor of the ICHO Gazette. Her dream was to keep some of the foundation lines in Curlies going by breeding the Fredell line. Her favorite Fredell mare Thunder's Jewel was to be her hope for the future. Jewel passed away at almost the same time Sharon did. There was truly a connection between them. Sharon's breeding program included Native line Curlies that she also wanted to preserve. She crossed many Curlies with Appaloosa horses as well. She also had a great interest in gaited Curlies, she is pictured on her gaited Curly, J Silverheels "Jake". Ernest Hammrich, a longtime Ipswich and Mobridge, South Dakota resident, was in the business of horses all his life. He sold horses to the United States government, the United States Cavalry, and the New York and Chicago Police departments. He supplied the U.S. Forest Service with pack mules that were used in the Rocky Mountains of Montana. In cooperation with the United States government, he sold and shipped 2 boatloads of horses to the country of Columbia. He spent 3 months in Bogata, Columbia, and set up horse raising farms for the Bogata government to improve their horses. 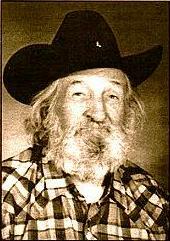 He also raised rodeo stock that went to rodeos all over the West, some to the National Finals Rodeo. Ernie was a premier horse breeder, and his mark will forever remain on the rare North American Curly Horse. Ernest gathered and preserved one of the oldest Native American bloodlines of Curly Horses in the world, that would have been lost to obscurity forever, if not collected bred and preserved by Ernie. His curlies are often referred to as the Bad Warrior Curlies, since Ernest gathered and saved these last descendants of those Curly horses once owned by the Sioux, stolen from the Crow in 1801. The Eli Bad Warrior family, Sioux neighbors of Ernie's, had some of these last known Curly horses left alive. Ernie purchased those horses from Eli's family, as well as from another gentleman by the name of Slim Berndt, who also had some of Eli Bad Warrior's stock. Thanks to Ernie, the Bad Warrior Curly Horses are still flourishing, and represent one of the most highly valued bloodlines of the North American Curly Horse breed. We lost Ernest Hammrich on Saturday, January 8th, 2000. He was 80. He was born Dec 1st, 1919, northeast of Ipswich, SD. He farmed with his father, and went into the threshing machine harvesting business, bringing in both his family's and his neighbors' crops. Pauline Peterson was teaching when Ernest acted as the auctioneer at a pie auction for the school. Not only did he auction off that fateful pie, but he also bought it, which led to a romance. Ernest and Pauline were married June 11, 1945, and had 4 children: Ellen (Ree), Ervin, Vernon, and Richard. They moved to Mobridge, SD in 1965. They have farmed and ranched together, laughed, lived, and celebrated life together, for 55 years. Ernest's life was celebrated, by his friends and loving family, on the 12th of January, when all had to say their final good-bye to the man who has touched so many lives. And I won't want a life that's soft or high. If you are a curly horse breeder or admirer and you never met Joe Mead, you missed out on a big piece of curly history and the best, most amazing curly stories ever. Joe was without a doubt the man with the biggest influence on the curly horses of today. He was a founding member of ABCR in the 1970s and was a long-time breeder of curlies in Alaska, Washington, and North Dakota. His horses are in the pedigrees of many if not most of the curlies alive today. One of Joe’s stallions was the sire of my first curly baby in 1991, and he sold me my first two curly horses. I know he helped start dozens, if not hundreds, of other people in the curly horse business. Joe’s colt, *Ebony’s Twister, was the foundation sire of one of our two curly bloodlines and was the first curly stallion in France. 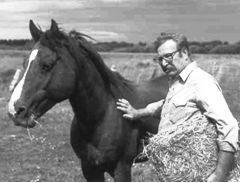 Joe’s horses have spread out all over the world; Joe was a legendary breeder with a great eye for what makes a good horse (of any breed) and an incredible memory of curly pedigrees. He also had an unending supply of tales about adventures with curly horses in Alaska and Nevada, where he loved to visit with his pal Benny Damele and horse-trade. Joe was 77 years old. He will be missed by all who knew him. His passing is a great loss to the entire curly world, and our hearts go out to the Mead family and horses, who will miss him the most. I took this picture of Joe and Ruby Red King at Joe’s ranch in Sequim, Washington, in about 1991. Benny Damele had entrusted Joe with RRK (a Morgan stallion who sired many curlies) and a group of his best curly mares from Dry Creek Ranch, Nevada. Tears are close when I write this. A few days ago came the shocking message that Andrea Hempel, a good friend and fellow curly owner, just recently passed away. Andrea is leaving behind her husband Prof. Dr. Volker Hempel and two wonderful teenage children, Stefanie and Sebastian. It was Stefanie’s allergy that first put Andrea on the search for Curly horses. Andrea, Stefanie and Sebastian came to visit us in 2004. The kids had hardly ever sat on a horse, and they were all three thrilled to join me on a trail ride in the forest, also trying to trot and canter. This was the start of our friendship. After that I visited Andrea and her family every year in their home in the beautiful town Konstanz on the shore of the Bodensee in Germany, close to the Swiss border. Last time was now in August, my baby and I, staying three days with Andrea and Volker. Andrea was so happy to have me visiting, we had a great time together, of course seeing the horses, riding, talking, shopping, cooking and eating with the family. Andrea was so proud to show me her new gaited curly mares she bought this spring from Marv Woodke in Indiana, it was the DCC Drifter daughters Princess Diamond, Lil Bit O Honey and Katrina. From before she had the mare Akipa and the stallion Mangas from Musse Gruen in Sweden, and the mares Beauty and Grace from Bengtssons in Sweden, although Grace was later sold. Andrea was a lady that did everything for her family. And her family was happy for Andrea’s enthusiasm about her horses. She loved to teach the Curlies tricks and could share many stories about how quickly they learnt new tricks, often just by looking when Andrea was playing with one of the other horses, then they would copy the behaviour to get the appraise from Andrea. Andrea was very energetic and one could think it would easily stress a horse, but actually the horses were so calm around her. I am convinced she shared an extraordinary bond with her Curlies, she loved them and they loved her back. Being a physician herself, Andrea was interested in genetics and breeding. We shared many emails discussing breeding combinations of gaited Curlies. Following the tragic event of Andrea’s death, fellow curly breeders in Germany came to help the family and generously opened their farms for the mares and foals so they could be taken care of without burdening the family in this time of shock and grief. Our heartfelt thoughts and sympathies go to the family and friends of Andrea Hempel. Andrea Schaap was born October 23, 1955 in Verdun, Montreal, Quebec. She had one older brother, Lloyd, who is now deceased also. Her father was a psychoanalyst in the army during the World War II in Great Britain and then became an insurance broker after moving to Canada following the war. Her mother was an insurance secretary but became a homemaker and mother after meeting Andrea’s father. Andrea only saw horses in books and movies until she touched her first horse in the picture that accompanies John Schaap’s memories of Andrea. (Gazette 2010 Spring/Summer) From that point on, she was hooked. Andrea attended Jean Rénè High School, Dawson College, and veterinary school at Guelph University, from which she graduated with honors. In 1979, Andrea began her veterinary career in London, Ontario. In 1980, she met John on a routine farm call to inspect his pig herd. This is how John describes their first meeting and subsequent ones: “When she walked into the room, I was castrating baby pigs. Suddenly, the lights came on, (well, maybe the lights were on already because one cannot castrate pigs in the dark.) and this beautiful woman was looking at me with admiration in her eyes. She said she was impressed with the way I could castrate a pig with one hand, in a gentle fashion and put them back with the sow without noise or disruption in the room. In other words, it was my technique that impressed her, and she wasn’t interested in me at all. Andrea came back around the next week for no apparent reason other than to hang out with me. And three weeks after our first meeting, we were engaged to be married.” John and Andrea were married on May 4, 1980, and shortly thereafter moved to a 30-acre farm in Melbourne, Ontario. Their son, Gary, was born in February 1981.
eventually reached 43 horses on their 300-acre farm. After John and the kids, Digger was the love of Andrea’s life. He was a prepotent stallion who passed on his strong conformation and easy disposition to his offspring. Digger sired more than 30 curly horses when bred to straight and curly mares, and many curly horse breeders now have his progeny as their herd stallions or broodmares. Unfortunately, in March 2004, he caught his foot in a horse-proof wire following a snowstorm and died before he could be discovered and freed. His loss was a terrible loss to Andrea and to the curly horse world. Andrea was a fervent believer that the curly horse world was small enough in members, horses, and genetic diversity that all of the members should work together in one organization for the best furtherance of the breed. But when that became impossible after the ABCR closed its registry in 1999, Andrea became one of the founding members of the fledgling International Curly Horse Organization. come to a consensus decision that moved the organization forward over the past ten years. The ICHO will go on and move ahead to accomplish new things and hopefully help identify the curly gene(s) so that we can better understand the genetic makeup of our wonderful breed. But we will miss Andrea. She is irreplaceable. 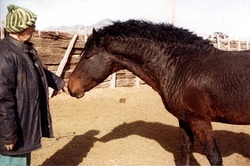 John has said that he could tell many stories about Andrea and her patience with horses and people, but the one he loves best was when Andrea would get a dreamy look in her eyes and describe the wonderful feeling she had the first time she touched the live horse in the picture that set the course for her life working with animals. People within and outside the ICHO who met Andrea will carry a similar wonderful feeling from having known a truly wonderful person. We are all lucky and blessed to have known her.